Microboards Technology will begin bundling DiscLabel Limited from Smile Software for the Mac for use in designing and printing disc labels with all Microboards Disc Publishers and Printers. DiscLabel is a full-featured application for printing CDs, DVDs, and Blu-ray discs. In addition, advanced features such as printing jewel case inserts or disc labels on equipment other than a Microboards Disc Printers and Publishers are available by upgrade from Smile Software. Microboards, the leading manufacturer of disc publishing equipment, has already seen strong revenue growth through its alternative offering in the Mac market. “Our PrintWrite Mac offering was the market’s first stable platform for Apple-based disc publishing, and the market has been more than receptive to its introduction”, said Microboards COO, John Westrum. 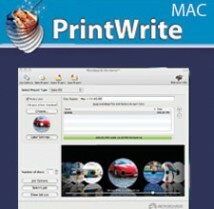 DiscLabel Limited is being included on the installation disc along with Microboards’ renowned publishing software, PrintWrite Mac, in all Microboards products. Microboards’ award-winning line of products is available through a worldwide channel of value-added resellers. It includes the compact and economical G3 Disc Publisher, and the high-yield, low-operating-cost MX Series of industrial disc publishers.